It was business as usual for Kate Middleton as she stood on the steps of St Mary's Hospital and introduced her third child to the world on Monday evening. The hairstyle was reassuringly predictable. The smile switched between its two settings: demure and dazzling. And the outfit choice - a red Jenny Packham smock dress - was as judicious as ever. The 36-year-old's poker face has been refined to the point that it's almost impossible to know how she's really feeling - even seven hours after giving birth. There is no doubt Middleton would make a superb poker player, but on Monday, as she stood outside the hospital, there was one tiny, almost imperceptible, 'tell' that revealed the pressure she's under to keep up appearances. Her poker face might have belied the lack of sleep, but her feet suggested the strain of the never-ending walkabout. 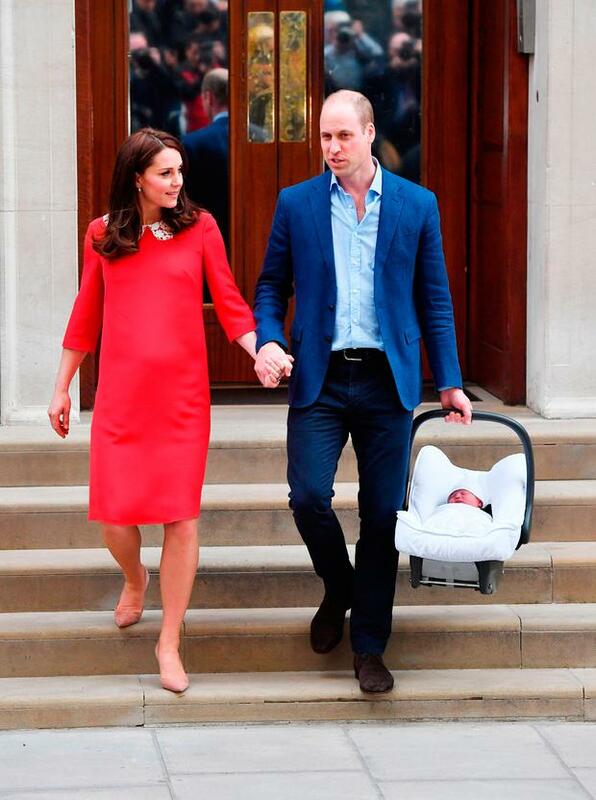 Middleton is one of those genetically-gifted creatures who doesn't suffer from swollen ankles - even after giving birth. This time around, however, the regulation mid-height Gianvito Rossi heels didn't fit with the same Cinderella precision. The suede, stiletto-heeled pumps that her stylist, Natasha Archer, delivered to the hospital earlier that morning were a shade too snug and, for the first time ever, the woman who could teach us all how to run in high heels looked like she might have preferred a pair of slippers. Most new mothers opt for flats or slip-ons when they're leaving the hospital. Of course, most new mothers don't have to pose for a press-call shortly after giving birth. This is probably why Middleton prefers shoes of the vertiginous variety - even when she's dizzy with exhaustion. Let's not forget that she gave birth to her third child at 11.01am. At 6pm, she was ready for her close-up. 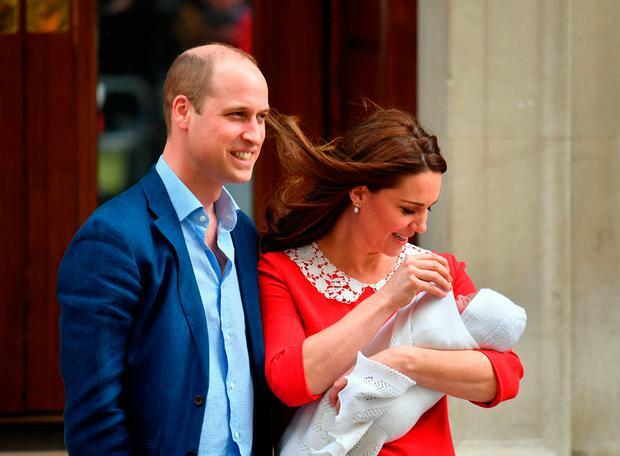 That gave Middleton less than seven hours to rest, bond with her child and get a signature bouncy blow-dry from Amanda Cook Tucker, her personal hairstylist. 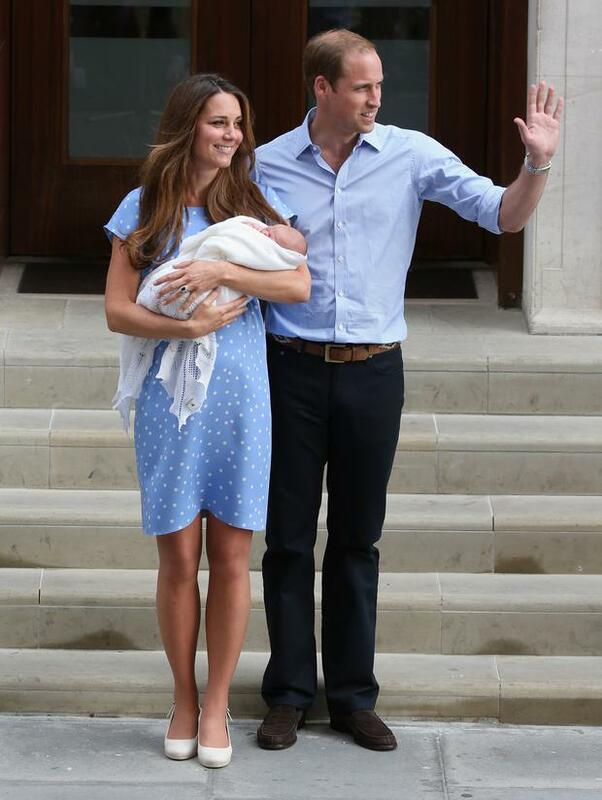 Presumably a tyrannical, clipboard-carrying Palace official orchestrated the entire post-partum transformation. "Outfit by British fashion designer: check. Sartorial tribute to Princess Diana: check. Mid-height heels: check." I've never given birth but I've seen the aftermath enough times to know that squeezing into a pair of stilettos is the furthest thing from most new mothers' minds. Seven hours after birth, most new couples are still coming to terms with the trauma they just experienced. Women look almost beatific in their vulnerability; men look like they've just listened to The Dark Side of the Moon on LSD. Sure, some women reach for their make-up bags because they want to look 'presentable' for visitors but, for the most part, they don't give much thought to fashion when they've just been told they have to wear an adult nappy. Funnily enough, photographs of an immaculately-dressed post-partum Middleton always put me in mind of Britain during WWII, when red lipstick became an affirmation of dignity and the morale-boosting mantra 'beauty is your duty' was trumpeted on the pages of Vogue magazine. In spite of what you had been through or what you were going through, it was essential to keep up appearances for the troops. Fast forward to modern-day Britain and the Duchess of Cambridge has her own troops to consider. Whether by accident or design, Middleton embodies a Cath Kidston-buying, home-baking, allotment-owning brand of motherhood. She represents the type of mother who always has a front-door face and who never, ever wears Uggs while leaving the maternity hospital. Perhaps Meghan Markle will keep it real in athleisure and Crocs. Her sister-in-law, on the other hand, was never really given a choice in the matter. Royal baby: Will Kate Middleton still attend Meghan and Harry’s wedding? So, Kate Middleton is in labour - what happens now? Meadhbh McGrath When the news broke that Prince William and Prince Harry would be splitting their households, there was one question on royal-watchers' minds: what happens to the Instagram?